So, I don’t know about Y’all, but I love to drink water. However, I know I’m more of the exception than the rule. My husband, kids, and I drink gallons a day and don’t crave anything else; but, again, I know this is the exception. For many, drinking water is “boring”. They want sparkles and flavors and glitter… Well, I’m here to give you a couple of tips to bring you to the hydrated side of the road. First, here’s a water intake calculator for you! Check it out, because it is different for everyone. Y’all probably know by now that I’m not at all a “one-size-fits-all” kind of girl, and that goes for water as well. It all depends on your age, weight, and activity level and this nifty calculator saves the day. Now, why should you be drinking more water, you ask? Maybe it’s because your body is made up mainly of water! Hence, everything works better when everything is adequately hydrated. Think of a flower! If a plant or flower is lacking water, it droops, the leaves sag, petals fall off. Well, my leaves are saggy enough, so I want to keep those babies hydrated and as perky as I can! Being hydrated also means you’re less likely to mistake thirst for hunger. If you’re feeling the urge for some chocolate chip cookies, take a swig of cold water and see if you can hold off a little longer. 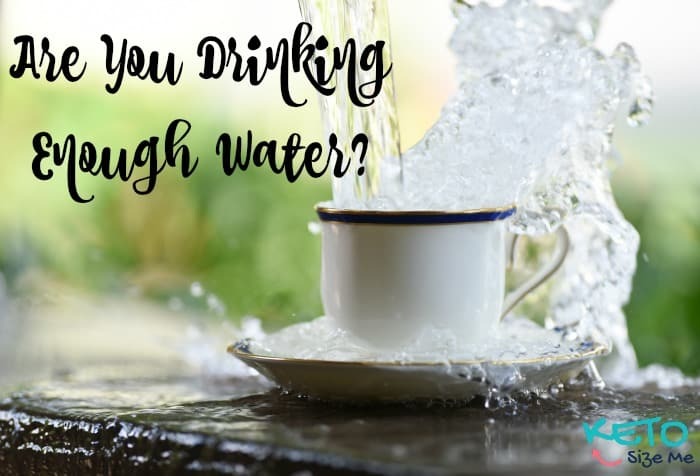 Thirst can often masquerade as hunger and it takes water to digest food, so it’s a double whammy for your body if it needs water and you’re just giving it more food. 1. Try it cold! Heap some ice in your cup! Not only do you burn more calories because your body has to heat back up, but you won’t “taste” the water as much. You can either store water in the fridge in a pitcher with your add-ins, or you can use of these cool diffusers. 3. Add some sparkle! I have a friend that absolutely will NOT drink regular water, but she will drink tons of sparkling water that she makes herself from her SodaStream. You can either just use plain water or add your flavors, and you have wonderful water that’s refreshing and may even feel like a treat. 4. Now, if you want to get fancy, you can make your own kefir water. This is not for the lazy (like me), but if you’re willing to roll with it, this stuff is magnificent for you and tastes delicious. If you do it, let me know how it turns out. 5. Add flavor! I like to add BCAAs or flavor packets. BCAAs are excellent for building muscle and can also give you a boost of energy. These both use artificial sweeteners, though, so that’s something you have to consider. 6. I carry around one of these water bottles at all times. I love the chute because it doesn’t take an extra lung and some tough teeth to drink from it, and I love that it’s a liter, so I’m more likely to drink more. I fill these lovelies up a few times a day and have them at the ready. 7. Caffeinated drinks are not water! Coffee, tea, etc. are all Dehydrating liquids! My dad will drink gallons of coffee and not touch a drop of water, but firmly believes he’s hydrating himself because he’s drinking something made with water. Not the same thing at all, so don’t be fooled!!! I hope this helps some of you. Let me know how it goes and keep drinking!